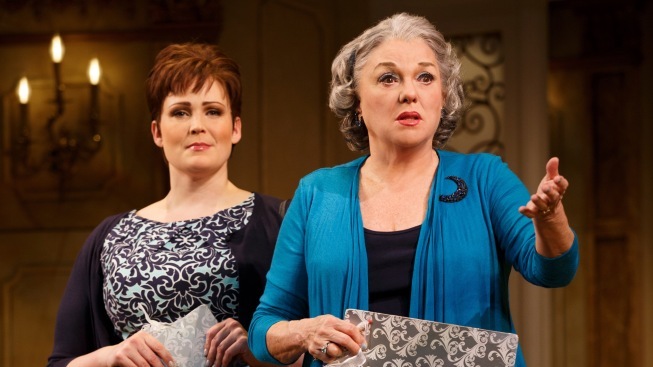 Tyne Daly ought to be nicer to her daughter, played Lisa Howard. Broadway’s so-far stuffy spring season needed to loosen up, and relief arrives with the campy ensemble comedy “It Shoulda Been You.” Now open at the Brooks Atkinson Theatre, the musical is notable as the Broadway directing debut of David Hyde Pierce, the “Frasier” star. “Shoulda” has a stock set-up: The Steinberg and Howard families have gathered at a fancy hotel for the interfaith union of their children, Rebecca and Brian (Sierra Boggess and David Burtka). So fresh-faced are these two they could model for the cake-topper. Such purity can only foreshadow trouble, and indeed, disaster strikes when Jenny, the bride’s sister (Lisa Howard), accidentally dials Rebecca’s ex-boyfriend, Marty (Josh Grisetti), clueing him in to the fact he wasn’t, you know … invited. Jenny is the emotional heart of the comedy, a hodgepodge of capers and confessions that would probably fall flat in the hands of less experienced performers. As it is, this cast is as close to a dream team for a wedding comedy as you can get. Howard is appealing and accessible as the daughter who puts up with endless guff from her mom about her weight. A veteran of five Broadway shows (notably “The 25th Annual Putnam County Spelling Bee”), she performed this role during a 2011 run in New Jersey. Grisetti, finally getting his Rialto debut after the demise of “Broadway Bound” some years ago, is equally likable, with a hyper-caffeinated entrance that has us questioning whether he’s gotten over the breakup. Then there are mom and dad, and the other mom and dad. Daly is wonderful as always, but the character is almost unnecessarily obnoxious. David’s parents are “Frasier” vet Harriet Harris and Michael X. Martin (recently seen in “The Bridges of Madison County”). I enjoyed watching pros Daly and Harris go up against one another, sniping while getting their hair done, and so on. That said, I thought a running gag Harris has about trying to make her son gay was an eye-roller. I don’t think there is a class or creed of human who isn’t pandered to in some way, shape or form during the intermission-less 100-minute comedy. You can almost hear the writers working down a checklist. Boggess (“The Little Mermaid”) and Burtka (below) are good, but tend to fade into the background as the bride and groom. She’s got a lovely lament with “A Little Bit Less Than,” a sweet song about living up to familial expectations. A big twist at roughly the halfway point sends “Shoulda” off in a more serious direction. It feels dated, and it certainly caught me by surprise. “Shoulda” has a book and lyrics by Brian Hargrove (he’s Pierce’s husband), and pleasant, if run-of-the-mill, music by Barbara Anselmi. Overall, this is fair-to-middling material that’s elevated by a superior cast. It’s a good show, but you can’t help thinking it shoulda been better. “It Shoulda Been You,” with an open-ended run at the Brooks Atkinson Theatre, 256 W. 47th St. Tickets: $90-$139. Call Ticketmaster, 800-745-3000.